How to choose the right duvet? Fluff: Shake your duvets daily – the filling will fluff up and the duvets will regain their original shape. Air out: Absorbed body moisture must evaporate again. Never leave the bedding out in fog or in wet or rainy weather. Do not leave in direct sunlight: Direct sunlight interferes with the natural moisture of feathers and down, which is important for maintaining elasticity. Gently clean: If necessary, remove dust using a soft brush. Do not hit: Hitting may damage the duvet, blemish the feathers and negatively affect the fluffiness of the filing. Do not vacuum: The vacuum cleaner will damage the fabric, the canvas will loosen and the blanket will no longer be feather proof. Avoid everything that causes extra work! Washing: Give the duvet to a professional cleaner or wash in your own washing machine with a minimum capacity of 7 kg with a mild detergent at 60°C. Drying: In a dryer with a minimum capacity of 7 kg. Take extra caution not to over dry! Proper drying returns the feathers their original downiness. If the blanket is not properly dried, lumps and clots may occur. Please follow the instructions on the individual products! Maintenance rules: Clean the pillows every 2 – 3 years, at the latest, renew after 4-5 years. Clean duvets containing down feathers every 4 – 5 years, at the latest, renew after 8 – 10 years. Under which duvet to sleep in the summer and under which in winter? Duvets filled with feathers or down are ideal for both summer and winter; additionally it is possible to choose an adequate level of warmth. Do you sweat easily? Or do you sleep in a warm, heated room (20-25°C)? If your answer to these questions is affirmative, then choose a lighter duvet. Do you sleep in a relatively constant temperature (18-20°C) regardless of the season? Do you have average temperature requirements for your duvet? In that case, we recommend a duvet with medium thermal properties. Do you get cold easily? Do you sleep in a relatively cold environment (16-18°C)? If so, choose a warm or winter duvet. How large should the duvet be? Scientists focusing on sleep came up with a study that the ideal duvet, under which one feels the most comfortable, should be at least 30 cm (or 20-25%) longer than the length of one’s body. Our feet are the body part with the worst blood circulation and they are also the part of the body protruding from too short a duvet causing restless sleep. Well-rounded sleep is only guaranteed if a person is able to comfortably stretch in bed while still being covered by a nice warm duvet. For taller people, we offer duvets of comfortable sizes (135×220 cm and 155×220 cm); these duvets also provide comfort to persons of regular growth. We also have something for couples who like to share one blanket, for example duvets with the size of 200×200 cm, as well as 240×200 cm. Humans spend about one third of their life in bed. Healthy and quiet sleep is important for a happy life; recharges us and makes us happy. Exceptional feather qualities provide an optimal climate to let your skin breathe and you wake up fully rested. Feather duvets absorb large amounts of moisture and thus ensure natural thermal regulation during sleep. The quality of feathers is determined by the ability to lock in air – the more the better. Another feature of quality is the ability of a feather to keep its permanent shape – to remain fluffy. The faster the bedding returns to its original shape, the higher its quality. 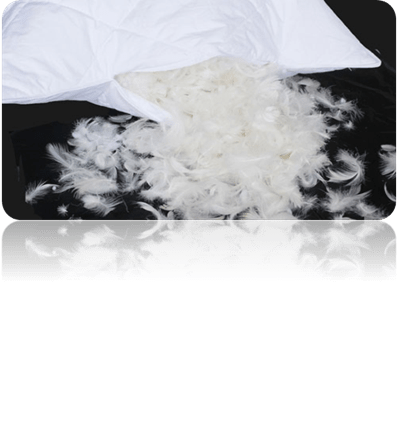 To ensure your feather bedding will retain its high quality and fluffiness, it should not be compressed too often. The higher quality the feather filling is, the lighter the feathers are at the same volume. 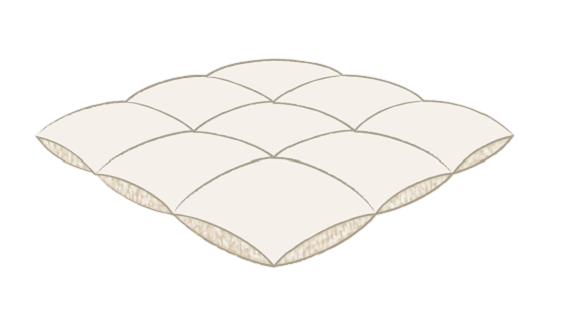 Quilted duvets are the most common types of duvets; they are sewn so that the blanket consists of regular squares. There is no filling in the corners of the squares, which allows for better air circulation. 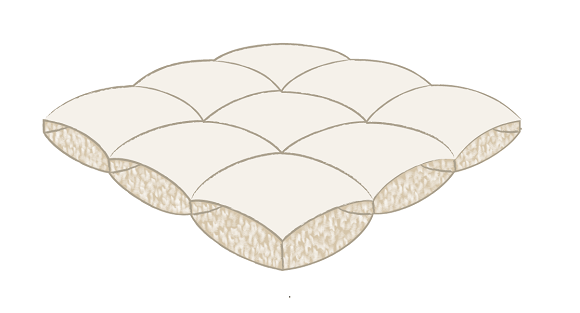 Quilted duvets with light filling are suitable for summer months. The so-called year-round duvets with moderately thick filling are also quite popular. Due to the simplicity of maintenance, these blankets are also suitable for hotels. Cassette style duvets are characterized by seamless internal three-dimensional chambers measuring 1.5 cm to 10 cm, depending on the filling quality and the warmth of the blanket. Most duvets are produced with 4 x 6 chambers and the standard duvet size 135×200 cm. Such separation of the duvet into chambers ensures even distribution of the feather filling and thus maximizes the insulating properties of the duvet, the air circulation and its absorption capability. The revolutionary design of this luxury pillow consists of two outer chambers and one internal chamber. The inner chamber is filled with duck / goose feathers, ensuring optimum volume and support. Both outer chambers contain down, resulting in a soft, downy and pleasant feeling of “warm embrace” during sleep. 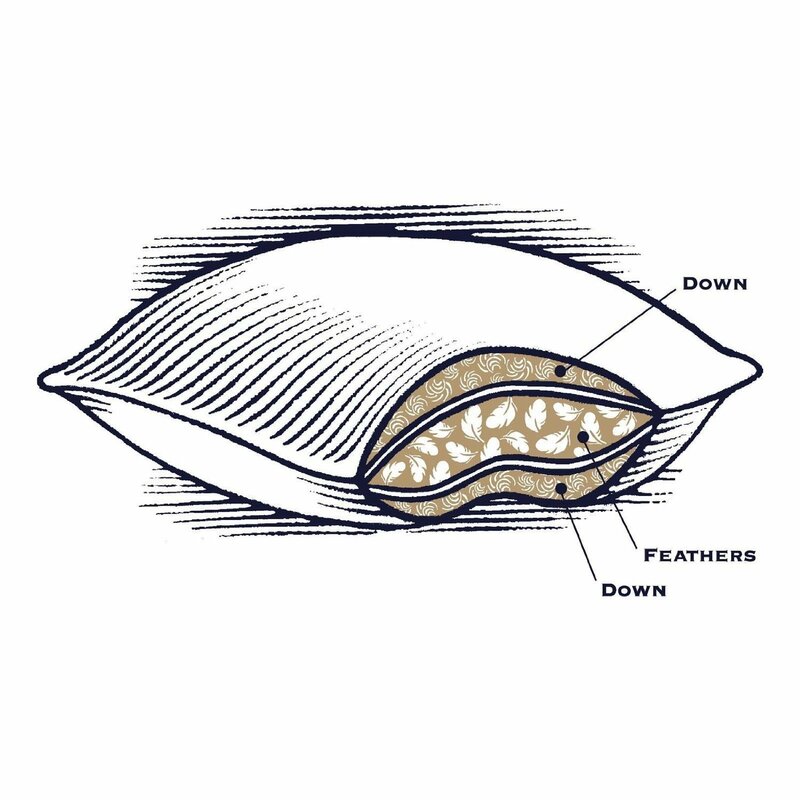 Our single-chamber pillows provide perfect head support during sleep, hold their shape and are usually filled with low-grade duck / goose down feathers. These products are especially interesting because of their very affordable price.